Get those credit cards ready on Friday December 5, because this baby has a set edition of 1000! Shortly after Trailer A debuted on November 17, 1998 and in time for the busy Thanksgiving weekend, the first teaser poster for TPM and similarly rendered banners appeared in multiplex lobbies nationwide. The poster was first unveiled outside of the Chinese Theater in Hollywood and went up for sale via the Official Star Wars Fan Club that day. 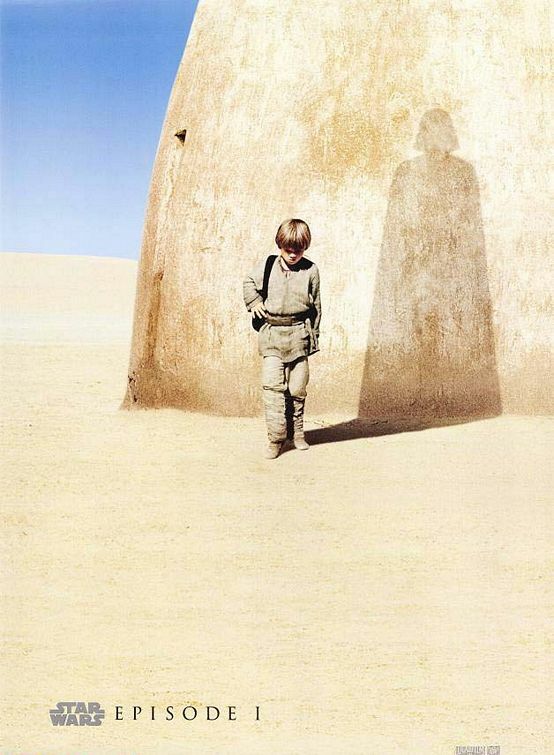 The concept was simple but striking: a young Anakin on sunny Tatooine, the shadow of Darth Vader behind him, and the words “Episode I.” It told you this was the background story of Darth Vader’s youth. The image became iconic almost overnight: everyone from Bart Simpson to Dennis the Menace to Weird Al Yankovic has used the imagery. To this day it remains a favorite among fans and movie poster connoisseurs. This was also the first SW poster to use photography instead of artwork. 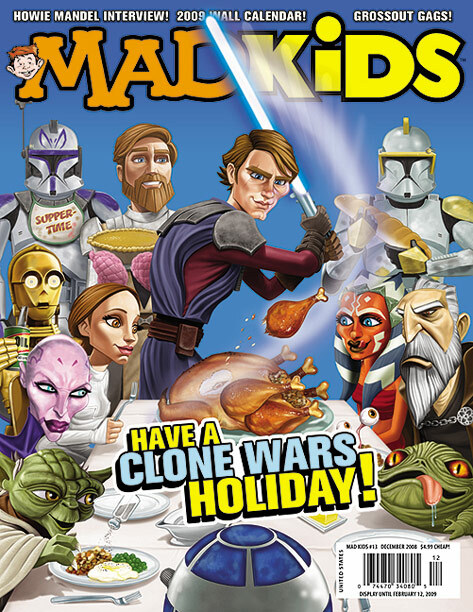 British fan site Lightsabre.co.uk has a short interview with Clone Wars writer Kevin Rubio. He talks a little bit about his “Bombad Jedi” episode, “Troops,” and more! Escape the stress of Thanksgiving, crazed relatives, and the Black Friday stampede by catching all 6 films on Spike TV (yay, finally got Spike in HD on my service). Check the schedule here. I still haven’t found any clips of the Geonosis monster-truck-rally skit, but I’ll keep looking. Tags:PT references, sw on t.v. Only 2 weeks left to get in on our autograph signing with the Wookies of “Revenge of the Sith!” This exciting piece features 9 signatures of the Wookies themselves including Creature Shop Supervisors Dave and Lou Esley. We have two different group images available in a stunning 16×20 size. Additionally, we have several individual character images available for this signing. Orders for “The Wookies” Connoisseur Series ends 11/30/08 at 11:59:59 EST. Please contact Wattographs with any questions. The Unofficial Clone Wars Site has a great interview with novelist Karen Miller, whose CW book should be out very soon!